John F. Shafroth, Jr. graduated from the Naval Academy in 1908. He was an instructor at the Army War College, navigator on USS Arkansas, executive officer of the USS West Virginia from 1933-1935 and CO of USS Indianapolis from 1938-1940. At the outbreak of WWII, he was on Admiral Nimitz’ staff at the Bureau of Navigation. He commanded COMCRUDIV 3, COMBATDIV 8, COMBATRON 2, and was Inspector General of the Pacific Fleet. He retired in 1949 as Vice Admiral. During his service he was awarded the Navy Cross, Legion of Merit, and Gold Star medals. 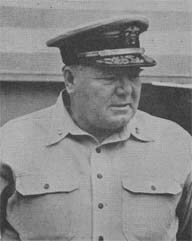 Considered America’s biggest Admiral, “Big Jack” Shafroth weighed 280 pounds and he was present on USS Missouri for the Japanese surrender that ended World War II. He was president of the Naval Historical Foundation from 1961-1967. The Navy Cross is awarded to Lieutenant Commander John F. Shafroth, Jr., U.S. Navy, for distinguished service in the line of his profession as commanding officer of the U.S.S. Terry, engaged in the important, exacting and hazardous duty of patrolling the waters infested with enemy submarines and mines, in escorting and protecting vitally important convoys of troops and supplies through these waters and in offensive and defensive action, vigorously and unremittingly prosecuted against all forms of enemy naval activity.